“…great humour throughout and the romance was handled really well … the plot resolution was fantastic…” Ashley Capes author of The Bone Mask Trilogy. “…more twists and turns than an Agatha Christie whodunit, and more surprises than a box of Cracker Jacks. Lee Child will blanch with envy,” Deforest Day, author of A Cold Killing. “…keeps you up at night, turning the page, wanting to know what happens next. A nice mix of scenery, relationships and action, with plenty of mysterious twists and turns, keeps the pace of the story moving.” Suzanne Pherigo, ARC reviewer. The above reviews say it all really. But here are my thoughts. Kerry Donovan’s writing style is admirable; his method of telling a story is easy to read but gives a depth to a plot that keeps the reader interested. The book is set in a small town called Lucky Shores in the Colorado Rockies, a town struggling in poverty. But rich in disparate characters. I loved the protagonist Chet Walker, a musician travelling around the country, looking for gigs to perform in wherever he can find them. The author has created a many-sided character with a mysterious background that if deftly revealed as the story progresses. And Joey (Josephine) Dolan is a perfect foil for him; yet another rounded character. In fact there isn’t one character in the book, whether I liked them or not, that I didn’t believe in. The dialogue differentiates all these characters, it’s easy to work out who is speaking without the attributions and although the author uses American euphemisms, syntax and slang it was easy for me to read; in fact it would have been wrong not to stay true to the setting of the book. And the descriptions of the settings are evocative and full of imagery. All create a picture for the action. The pace of the plot moves steadily but with many surprising twists and turns, building the tension as the story reaches the denouement. Yet is this the end of Chet Walker? Somehow I think not. 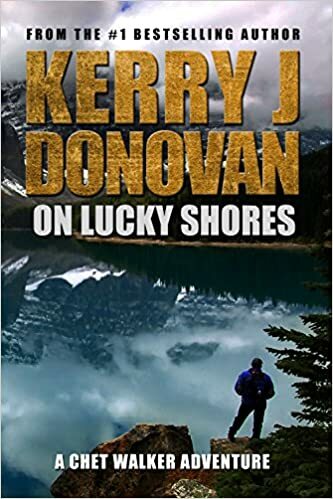 This entry was posted in blogging, Book Reviews, Books, crime, mystery, Review, Thriller and tagged #blog, #RBRT, authors, book review, crime, Kerry Donovan, mystery, On Lucky Shores, Thriller by Judith Barrow. Bookmark the permalink. Many thanks Judith, a lovely review. Judith, thanks millions for such a thoughtful and positive review, So glad you liked the novel. Hopefully, Chet will keep in touch and let me know what he’s doing so I can jot it down and spread the word, but you know what he’s like now. Doesn’t give much away, eh? Hi Kerry. LOL – nope he doesn’t. But I think he wil be in touch and hopefully soon. And you’re very welcome – a great read. J.